A study online at the New England Journal of Medicine reports that DNMT3A mutations in acute myeloid leukemia are common and associated with poor outcome for intermediate-risk patients. Previously, our group had characterized the genomes of two patients with cytogenetically normal AML (AML1 and AML2). The first genome (AML1) was initially sequenced with Illumina short reads (1×36 bp), revealing eight novel acquired (somatic) mutations but none that were recurrent. 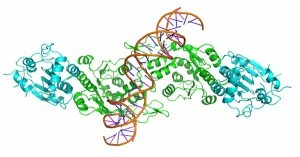 The second genome, AML2, harbored a recurrent mutation in the isocitrate dehydrogenase 1 gene (IDH1), which had recently been implicated in glioblastoma. Subsequent work has demonstrated that mutations in IDH1 and related gene IDH2 highly recurrent in AMLs with intermediate risk karyotypes (20-30% frequency). For this study, we resequenced relapse tumor from patient AML1 using current Illumina technology (2×100 bp paired-end reads), achieving higher diploid coverage and enabling the identification of several novel nonsynonymous mutations. One of these was a 1-bp deletion in the DNA methyltransferase gene DNMT3A predicted to cause a frameshift resulting in a truncated protein. Resequencing showed that it was present in the original tumor sample, and probably missed due to alignment difficulties for short reads. Screening the exons of DNMT3A in 281 additional AML tumors revealed that 61 (22.1%) also had DNMT3A mutations with translational consequences. The most common of these was a missense mutation at residue 882, found in 37 tumors. When we realized how common this mutation was, and considered that the gene involved is a DNA methyltransferase, I have to admit that a tantalizing picture emerged. In my mind, at least. Mutation could lead to aberrant methylation of the tumor genome. Demethylation unmasks oncogene expression. Hyper-methylation leads to genome-wide instability, causing more mutations that activate oncogenes and disable tumor suppressors. DNA methylation has long been suspected in cancer, but the relationship between mutation, methylation, and disease progression has not been definitively established. At last, it seemed like we would bridge that gap. We performed a number of experiments to determine if DNMT3A mutation status affected mutation rate, genome-wide methylation, or gene expression. First, we examined the 38 AML tumors that had undergone whole-genome sequencing (WGS) to ~25x coverage. Eleven of these carried DNMT3A mutations. There was no apparent correlation, however, between DNMT3A mutation status and the number of high-confidence mutations called genome-wide. Next, we assessed gene expression in 188 AML tumors and matched (normal) controls on microarrays. DNMT3A was expressed in all 188 tumors and matched normals, regardless of mutation status. Unsupervised clustering of gene expression patterns did reveal distinct clusters, but none correlated with DNMT3A status. We further performed targeted cDNA resequencing in tumors with mutations, and confirmed expression of most mutant alleles at the expected 50% frequency (though some were not seen in any cDNA, probably due to nonsense-mediated decay). So no effect on mutation, and no changes in gene expression. Hold your breath, and let’s look at methylation. MeDIP assays revealed 182 regions that were differentially methylated between DNMT3A-mutated and non-mutated tumors. All were hypomethylated in the mutated samples. But there was no consistent effect on the expression of nearby genes. And, sadly, there was no global effect of DNMT3A mutaiton on DNA methylation. We were 0 for 3. Last but not least, we turned to the clinical data. When we stratified AML patients by risk (based on cytogenetics) and DNMT3A mutation status, some interesting patterns emerged. First, DNMT3A mutations were completely absent from the favorable-prognosis group. Mutations were enriched, however, among patients classified as “intermediate risk” – normal or unclear karyotypes. And the outcome for DNMT3A-mutated patients was significantly poorer. The adverse-outcome association was independent of age, although older patients with DNMT3A had the worst outcomes of any group. And the association held true regardless of the presence of other commonly-mutated AML genes (NPM1, FLT3, IDH1/IDH2). Thus, DNMT3A mutation clearly contributes to AML pathogenesis, even if the mechanism by which it does so remains elusive. The fact that DNMT3A mutations are selected against in favorable-outcome patients suggests a true biological association. A lot of work remains to be done. We still need to uncover the mechanistic effect of DNMT3A mutations that underlies the pathogenesis. But this work has furthered our understanding of AML, by identifying a highly recurrently mutated gene and providing a marker to help stratify patients of intermediate risk. As highlighted in a perspective by Shannon and Armstrong, clinical trials of DNA methlytransferase inhibitors in AML are already under way. It may not be long before genomic discoveries are translated into actionable information for the treatment of cancer patients.